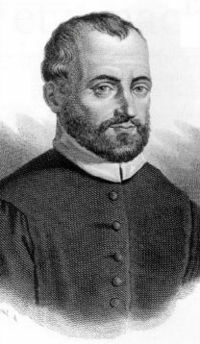 Giovanni Pierluigi da Palestrina (c 1525 – February 2, 1594) was an Italian composer of Renaissance music. He was the most famous sixteenth-century representative of the Roman school of musical composition. Palestrina had a vast influence on the development of Roman Catholic church music, and his works can be heard as a summation of Renaissance polyphony and seen as a catalyst for the preservation and adoration of the spiritual world. Palestrina was born in Palestrina, a town near Rome, then part of the Papal States. He spent most of his career in Rome. Documents suggest he first visited the Eternal City in 1537, when he was listed as a chorister at Santa Maria Maggiore Basilica. He studied with Robin Mallapert and Firmin Lebel. From 1544 to 1551, Palestrina was the organist of the principal church of his native city (St. Agapito), and in the last year became maestro di cappella at the Capella Giulia, the papal choir at St. Peter's Basilica. With his first published compositions, a book of masses which he presented to Pope Julius III (previously the bishop of Palestrina), he made such a favorable impression that he was appointed musical director of the Julian Chapel. In addition, this was the first book of masses by a native Italian composer; most composers of sacred music in Italy at that time were from the Netherlands, France, or Spain. In fact, his book of masses was actually modeled on one by Cristóbal de Morales, and the woodcut in the front is an almost exact copy of the one from the book by the Spaniard. Palestrina held positions similar to his Julian Chapel appointment at other chapels and churches in Rome during the next decade, most notably St. John in Lateran, from 1555 to 1560, and St. Maria Maggiore, from 1561 to 1566. In 1571, he returned to the Julian Chapel, and remained at St. Peter's Basilica for the rest of his life. The decade of the 1570s was difficult for him personally; he lost his brother, two of his sons, and his wife in three separate outbreaks of the plague (1572, 1575, and 1580 respectively). He seems to have considered becoming a priest at this time, but instead he married again, this time to a wealthy widow. This finally gave him financial independence (he was not well paid as choirmaster) and he was able to compose music prolifically until his death. He died in Rome in 1594. Palestrina left hundreds of compositions, including 104 masses, 68 offertories, 250 motets, 45 hymns and psalms, 33 magnificats and litanies, four or five sets of musical lamentations, at least 140 madrigals, and nine organ ricercari (however, recent scholarship has classed these ricercari as of doubtful authorship; Palestrina probably wrote no purely instrumental music). His Missa sine nomine seems to have been particularly attractive to Johann Sebastian Bach, who studied and performed it while he was writing his own masterpiece, the B Minor Mass. His compositions are typified as very clear, with voice parts well-balanced and beautifully harmonized. Among the works counted as his masterpieces is the Missa Papae Marcelli (Pope Marcellus Mass), which according to legend was composed to persuade the Council of Trent that a draconian ban on polyphonic treatment of text in sacred music was unnecessary. However, more recent scholarship shows that this mass was composed before the cardinals convened to discuss the ban (possibly as much as ten years before). It is probable, however, that Palestrina was quite conscious of the needs of intelligible text in conformity with the doctrine of the Counter-Reformation, and wrote his works toward this end from the 1560s until the end of his life. The "Palestrina Style"—the smooth style of sixteenth-century polyphony, derived and codified by Johann Joseph Fux from a careful study of his works—is the style usually taught as "Renaissance polyphony" in college counterpoint classes, although in a modified form, as Fux made a number of stylistic errors which have been corrected by later authors (notably Jeppesen and Morris). As codified by Fux, it follows the rules of what he defined as "species counterpoint." No composer of the sixteenth century was more consistent in following his own rules, and staying within the stylistic bounds he imposed on himself, than was Palestrina. Also, no composer of the sixteenth century has had such an edifice of myth and legend built around him. Much of the research on Palestrina was done in the ninteenth century by Giuseppe Baini, who published a monograph in 1828 that made Palestrina famous again, and reinforced the already existing legend that he was the "Savior of Church Music" during the reforms of the Council of Trent. The nineteenth-century attitude of hero-worship is predominant in this monograph and this has remained with the composer to some degree to the present day. Hans Pfitzner's opera Palestrina shows this attitude at its peak. Scholarship of the twentieth and twenty-first centuries tends to retain the view that Palestrina was a strong and refined composer, representing a summit of technical perfection. Yet, there were other composers working at the same time with equally individual voices and slightly different styles, even within the confines of smooth polyphony, such as Orlando di Lasso and Tomas Luis de Victoria. The foundations of his reform are the two principles legitimately deduced from the only references to church music in the Tridentine decrees: the elimination of all themes reminiscent of, or resembling, secular music; and the rejection of musical forms and elaborations tending to mutilate or obscure the liturgical text. Palestrina was immensely famous in his day, and his reputation, if anything, increased following his death. 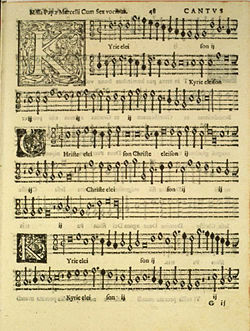 Conservative music of the Roman school continued to be written in his style (known as the prima pratica in the seventeenth century), by such students of his as Giovanni Maria Nanino, Ruggiero Giovannelli, Arcangelo Crivelli, Teofilo Gargari, Francesco Soriano and Gregorio Allegri. It is also thought that Salvatore Sacco may have been a student of Palestrina. Palestrina's music continues to be performed and recorded, and provides models for the study of counterpoint. This page was last modified on 2 April 2008, at 13:44.